This study was compiled in 1980 to satisfy the requirements of what was then the Extra-Mural Department of London University when the author was studying for a Diploma in Local History. Information that has come to light since the study was completed has been summarised in a Postscript on page 46.
of London University when studying for a Diploma in Local History. to include illustrations from their collections. accounts for the 1760s of payments to militiamen’s families. made by the overseers regarding the time examinants were to be allowed to get a certificate or be removed. ones which give such interesting insights into local history. were reasonably effective, particularly in the relief of the aged, sick and orphaned. anxious to avoid the imposition of any further burden on overstrained parish funds. was presumably in work and managing to pay his dues, for he was not exempted from tax, fell ill in 1677.
the funeral (and presumably acting as pall bearers). them Masters, and spent at their several bindings the sum of 21 . 00 . 10.
paying church or poor rates. ruling that if any refused to wear the badges, they would forfeit parish relief. when the often much abused (but not, so far as we know, in Mitcham) system was finally abolished. potential rolls of freeman and electors, a status only a minority of pauper children could expect to attain. workhouse at his cotton manufactory, and on December 13th 1795 we see them bargaining with Messrs.
but the practice was to continue for nearly thirty more years before its final abolition. Workhouse provided he keeps them well in Clothes which shall be enquired into at the half years End. from falling into madness and that they have him forthwith dipt in the Salt Water. involved a visit to Epsom spa. be satisfied, and the officers’ reasonable expenses were to be met out of parish funds. for his removal to that town. show that such reciprocal arrangements were quite common. Widow Hubbard to be able to go to her sister Shepperds at Tooting and to be allowed two shillings and sixpence per week. Tooting parish was to be indemnified against any liability for her support. Munrow was allowed 2/- per week. were made for the Church Rate, Highway maintenance, and for bridges, gaols and other County purposes). March all weekly pensioners were required to attend with their children at Church at next monthly meeting. enough to buy three quartern loaves. management which might otherwise ensue, and partly to delegate the cares of day-to-day management. 1. Ques. Whither [sic] a Workhouse or not? in the Affirmative. 2. Ques. Whither to hire an House to place the poor together in? in the Affirmative. 3. Ques. Whither to purchase an House or not to place the poor together in? in the Negative. 4. Ques. Whither to adjourn till four? in the Affirmative. George Umfrevile be proper and convenient and fit to place the Poor together in are desired to hold up your Hands? Except Mr. Bond and James Jordan. was agreed upon at a rental of £12 p.a., possession commencing by December 5th 1737.
the Poor that shall be placed therein and that they be paid fourteen pounds a year for their Service from Lady Day next. appointment of a Thomas Bond and his wife to care for the poor at £10 p.a. of the workhouse master the constant concern of the Vestry. The choice of Angier was unfortunate, to say the least, and his subsequent performance most unsatisfactory. Justices as Overseers for the year 1765/66. Quite properly, he was not selected. rise of provisions and other expenses. remarkably high, yet as we shall see later, was actually insufficient. necessary for the relief of the poor of this parish pursuant to his … agreement. Beswell signed the minutes, “assenting and agreeing to the above order”. the committee and other parishioners that whereas Angier’s normal salary for the quarter was £112. 10.
trust”. He said he was willing to surrender to the parish misappropriated goods (sic) to the value of £44. debt was deducted from the sum received, and the balance paid to him. in the contemporary Vestry minutes, it would appear that potential revenue from this quarter was negligible. the failure of wage rates of workers on the margin of subsistence to rise in line with commodity prices. be purchased by the sd. Officers & persons employ’d to teach the same. procure as chief servant of the parish a fit person to care for the poor. the charges attending the same. minutes until December 1777, when once more it was agreed a workhouse manager should be appointed. a salary of £25 p.a. Vestry or Committee thinks proper. and compassion, succeeded in alleviating the lot of the least fortunate of their fellow parishioners. enclosure of the required parcel of manorial waste. parish, and to decide upon plans for the erection of the new building. have been regarded with apprehension by the village labourers and their families. person in the said Workhouse. His total allowance was now £500 p.a., which was still short of Ogle’s salary by £80. agreed with Govas, as it had been with Evans before him. in winter, except in the Poor-house”. transcribe the last order of Vestry and wait upon Henry Hoare Esqr with the same. from the Bible and the visits of the curate. Unanimously agreed to; to be a Standing Order of this parish. two further years, until replaced by a Richard Symmonds. of this parish and to have a Coat & Hat at the price of Six Guineas. make something on the side’, for his salary was little more than a field labourer’s pay! seek the advice of Mr Carter, the parish’s solicitor, as to the steps left open to them to enforce the order. dispute which could occur is well illustrated by a scandal which shook the village of Mitcham in 1787.
dispute and presumably the protesters paid up. 1. Surrey Record Society. Surrey Quarter Sessions Order Book 1661. XXXV (1934) 66-7. 2. Purley Library. LC.10. Typescript copy (origin unstated). 3. Surrey Record Society. Surrey Hearth Tax 1664 Nos. XLI, XLII Vol. XVII (1940). 4. Lysons, D., Environs of London I Pt. 1 (1811) 360. 1. Morden, W.E., A History of Tooting-Graveney (1897) 63. 2. Jones, A.E., From Medieval Manor to London Suburb (c.1970) 59. 4. Surrey History Centre. Court Rolls, Manor of Biggin and Tamworth. 5. Surrey History Centre. 2/5/7. watercolours of the workhouse by J. Hassell, dated 1823. 7. Surrey History Centre. 2/6/4. 1. Eden, F.M., The State of the Poor (1797). Edited by Roger, A.G.L. (1928). 2. Surrey History Centre. Court Rolls of the Manor of Biggin and Tamworth. 2. Brayley, E.W., A Topographical History of Surrey V (1850). 3. Merton Local Studies Centre. Tom Francis lantern slides. 4. Merton Local Studies Centre. Tom Francis lecture notes. History Notes – 22: Mitcham in 1838: A Survey by Messrs Crawter & Smith (2002). to the value of his property. parish “nearly opposite his house” on payment of half a guinea per annum to the Overseers of the Poor. week for her children “at present”. In his comments on the clothing of the working classes in the Home Counties Eden is also illuminating. Virtually no homespun cloth was made, and the labourers in general purchased their clothes ready made. a cast-off coat, which may usually be purchased for about 5s., and second-hand waistcoates and breeches. Their wives seldom make up any article of dress, except making and mending clothes for the children”. often was in the country, there was no need to retain hands out of season, for they could go on the Parish. the poor, and the labouring classes were obliged increasingly to seek relief from the parish to stay alive. the workhouse so undesirable that only in the most grievous circumstances would a person seek admission. rent from savings or from their tiny pensions from past employers, while some were on parochial relief. of parish government, which were still left to the Open Vestry and their elected officers. tradesmen and farmers, on which executive powers were immediately devolved”. sanctioned the enclosure of half an acre of land on Mitcham Common in 1806 for the erection of a windmill. opposition to the enclosure from the commoners and tenants of the manor. custom and not from the chargeable value of the property” which had led to inequalities over the years. tenants in lieu of rent. The owner was defined as the person receiving or collecting rent. also to appoint rate collectors. There were various provisions for enforcement, and penalties. determination of the landed classes to maintain the status quo. objects of relief, and is therefore justly entitled to the unanimous thanks and approbation of this meeting. stronger trade associations, but mainly because of the sustained demand for luxuries in the capital. 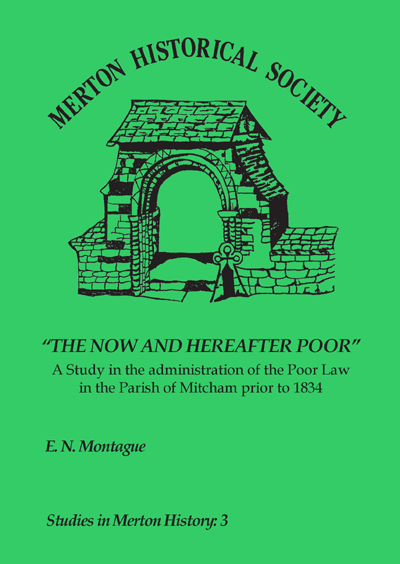 This entry was posted in Publications, Publications, Studies in Merton History and tagged in georgian mitcham, late georgian mitcham, mitcham, parish records, studies.